For the first time, US and European troops marched beside Russian forces as Moscow celebrated the end of World War II with its annual military parade on Sunday. According to The Wall Street Journal, Russia is looking at increasing its cooperation with the West, and a confidential report from Russian Foreign Minister Sergei Lavrov to President Dmitry Medveded outlines a program to improve Russia's economy by embracing Western technology. Yet, Medvedev's recent visit to Syria reveals that Russia is willing to make a wide variety of friends, whether America and Israel like it or not. Medvedev's visit to Syria early this week was ground breaking as the first visit of a Russian or Soviet head of state to that country, and it comes just days after the US renewed its sanctions against Syria for supporting terrorist groups and pursuing WMDs. Moscow has already agreed to provide Damascus with an advanced anti-aircraft defense system, and Russia may build power plants for Syria, including nuclear powered ones. "Cooperation on atomic energy (with Syria) could get a second wind," Medvedev said at a press conference with Syrian President Bashar al-Assad in Damascus. Russia has held to its position that all nations should be free to pursue peaceful nuclear power. Israeli Prime Minister Benjamin Netanyahu has gone to Moscow to try to persuade Russia from providing Syria with weapons, but Medvedev could only be convinced to delay the weapons sale and not stop it altogether. In a time of global economic struggles, Russia is looking for ways not only to exercise more influence in the Middle East, but also to strengthen and modernize its anemic economy. 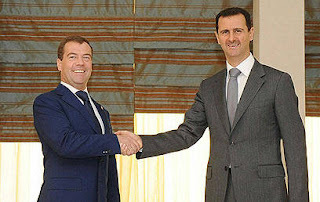 Medvedev justified the arms sale to Syria by saying the weapons were defensive and not offensive. Medvedev also met with Hamas leader Khaled Meshaal while in Damascus, and in the interest of creating a Palestinian state urged Hamas to release Israeli soldier Gilad Shalit. Russia has comfortable relations with Hamas, even while America and other Western nations refuse to deal with the terrorist group. While these unsavory friends may cause Western nations some consternation, Russia's desire to improve itself has given Moscow the impetus to do more to link arms with America and Europe. Obama's peace overtures along with his willingness to drop the missile defense shield in Poland and the Czech Republic and weaken America's support for Georgia have cheered the Moscow government. In a cover letter to his confidential report, Lavrov calls for Russia's creating "alliances of modernization" with European countries, especially Germany, France, Italy and Spain. Lavrov also wrote that, "It is necessary to find opportunities to use American technological potential." As Vyacheslav Nikonov, a foreign-policy analyst noted, "The sources of modernization and innovation are in the West, not the East." Nikonov sees things improving in Russia's foreign relations with the West. "The overall climate is better than it has been since the time of Perestroika," Nikonov said. "Russia has started to react to the more cooperative policy from the West." Friendly relations with America and Europe, Syria and Iran, not to mention China, are all well and good, but Russia has been leaving one extremely important country out of the circle of peace and cooperation: Israel. Instead, Israel faces a host of antagonism from around the world. President Obama has expressed support for Israel, but it is clear that Israel-US relations are not as warm as they have been in the past. The world's willingness to turn against Israel may eventually leave the small Jewish nation alone in a sea of Islam - alone except for the protective power of God Almighty.